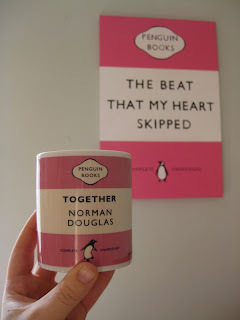 I love the Penguin Classics homewares, and have a couple of the cups which are my favourites to drink coffee out of. 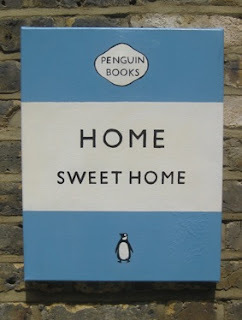 A while ago I saw canvases (screenprinted?) in The Conran Shop, which were nice and big and just so good looking. But I think they cost around £100, which was a bit much really. So, a few months ago I decided to make my own version. 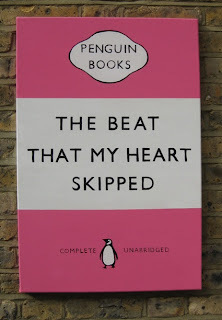 I couldn't decide which existing title to use, so I used a film title which I've always loved the sound of - The Beat That My Heart Skipped. 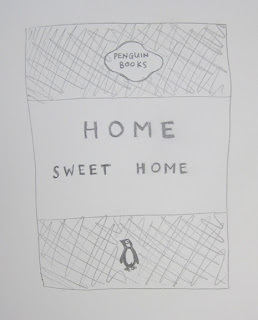 Then, last weekend my friend was having a birthday/housewarming party so I painted her a smaller version - Home Sweet Home! I've also posted them on the Living Etc. See What I Made forum, where each month someone wins some vouchers for the most inspiring show-and-tell post.